Bootie LA happens weekly - switching between The Regent and The Echoplex! Downtown LA’s hottest new venue: A converted 100-year-old movie theatre! Celebrating his birthday at Bootie LA! 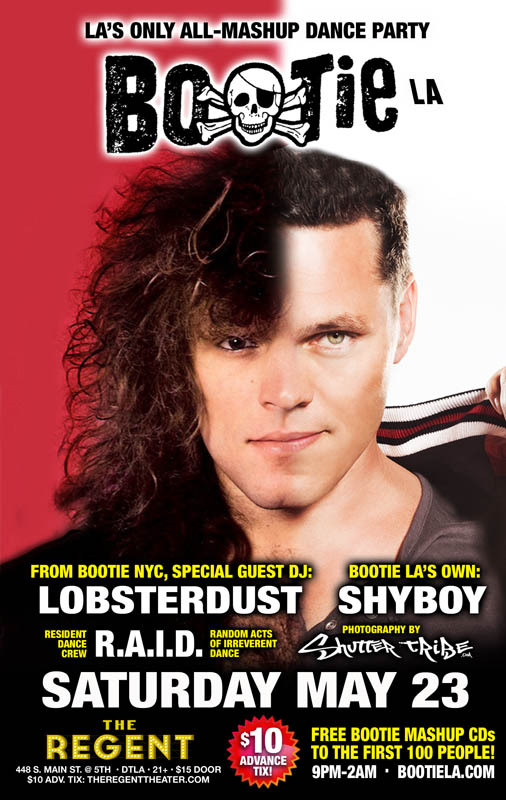 From New York City, Bootie LA is proud to present special guest DJ Lobsterdust. As “one of the premiere mashup producers in North America” (Mashuptown.com) as well as being the resident DJ at Bootie NYC, he mixes anything, from heavy metal to dub, and everything in-between, with a healthy dose of pop and electronic beats. Fatboy Slim called it “excellently eclectic stuff.” If you’ve ever wondered what Pharrell Williams would sound like with System of a Down, or what Bob Marley would sound like as the frontman for Iron Maiden, then you won’t want to miss this rare LA appearance! Plus, he’ll be celebrating his birthday at Bootie! Joining him on the decks will be resident Bootie LA DJ ShyBoy, as they throw down the greatest mashups in the universe all night long. Performing the Midnight Mashup Show and keeping the energy flowing will be resident dance crew R.A.I.D., ready to fill the stage with their patented go-go insanity. Shutter Tribe will be in the house to snap all the fun so you can remember what you did! Plus FREE Bootie mashup CDs for the first 100 people through the door! Best Dance Party in LA 2014?